The Chief of Staff to Governor Ibikunle Amosun, Tolu Odebiyi, has resigned his appointment with the Ogun State government. 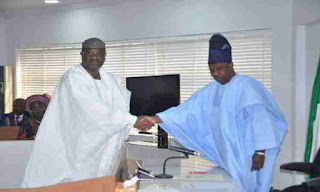 Odebiyi, the Senatorial Candidate of the All Progressives Congress (APC) for Ogun West, expressed deep gratitude to Amosun for the opportunity to serve the people of the state. In a statement, the APC chieftain said he was pleased with the confidence the Amosun reposed in him by the appointment and the process that led to his emergence as the APC Senatorial Candidate. Odebiyi noted that Amosun was a visionary leader who impacted positively on the socio-economic development of the state. He promised to make the progress of Ogun State paramount in all his future engagements and thanked the good people of the state for their support.